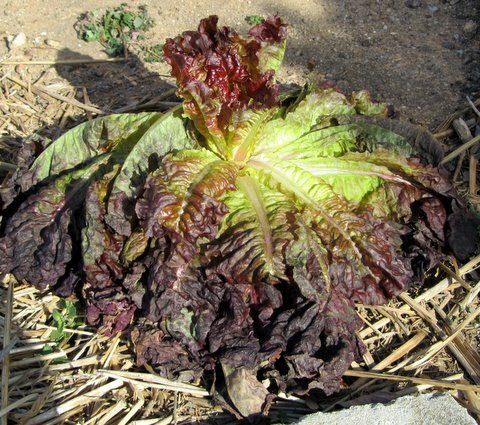 The last of my Red Sails lettuce surrendered to last night’s 22° F. temperature—and collapsed. It survived increasingly low nighttime temperatures over the last several weeks with frost-burned leaf tips, but 22° was just too low. This morning the nearby Ruby Red chard didn’t look quite as perky as it usually does either—but I think it will continue to grow slowly for a few more weeks. One chard plant survived last winter and put up leaves this past spring, probably courtesy of the insulation provided by last winter’s record snow cover. Other than chard, only root crops survive, though their leafy tops are suffering from the below-average temperatures too. Two or three Short n’ Sweet carrots await pulling, and maybe a dozen Cylindra beets. Underground, they should be safe well into January. Frigid days like today make me wonder whether I should try to lengthen my lettuce season for a few days or weeks with a row cover over wire hoops and anchored firmly all around. It should raise the under-cover temperature about four degrees. But with windy days like we’ve been having, where would I find the row cover in the morning—in the next county? And do I really want to go out in the frigid weather and open up and then close the row cover again to pick lettuce? Most gardeners don’t. Some gardeners do.